Upon awakening and becoming a Buddha, Shakyamuni gained a very important insight into the way phenomena arise as the result of cause and effect (Karma). He identified that each and every cause gives rise to an effect (modern schools of physics help to corroborate this understanding) This effect then in turn becomes the cause for another effect, continuing the chain of events. The Twelve Links of Interdependent Origination represents this cycle, and demonstrates the causal links of the arising body and mind phenomena of a lifetime. 1. Ignorance (Avidya) - The "mind" dissolves into a fundamental state of unconsciousness. 2. Mental Formations or Volitions (Samskara)- These are the gradual stirring of mental activity caused by karma. This activity begins the active phase of the pre-rebirth process. 3. Consciousness (Vijnana)- The ability of the mind to recognize something other than itself as an object. A sense of "self" arises, and phenomena are perceived as being separate from this self. (This happens rather quickly, and if you have ever observed infant development, you can watch this process occur). 5. 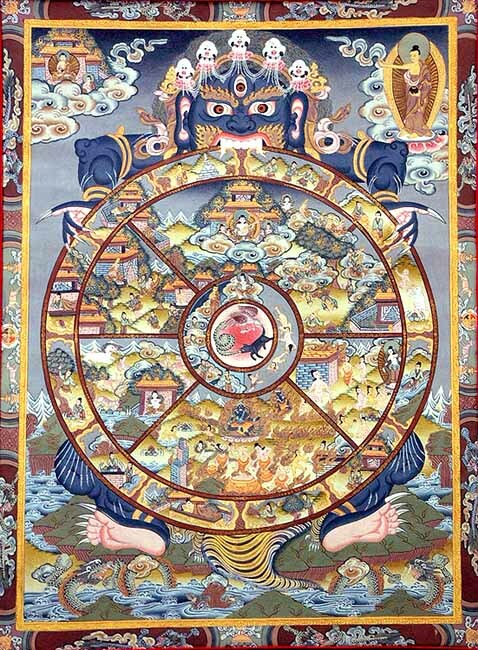 The Realm of the Six Senses (Shadayatana) - This link consists of the six bodily senses of sight, sound, smell, taste, touch, and thought. It also includes the objects of those sense experiences. 6. Contact with Phenomena (Sparsha) - This is the individual's phenomenological contact with the world. The interaction between sensory subjects and sensory objects creats the sensory awareness. 7. Sensation/Perception (Vedana) - This is the judgment of value a person ascribes to the experience of phenomena. This may include things such as "good", "bad", "hot", "cold", "salty", "sweet". etc. 8. Craving (Trishna)- The secong Noble Truth. A tremendous yearning for a particular experience, or an aversion to and desire for not having other experiences. represents clinging to a womb and the beginning of rebirth, and to manifest into some form that can have experiences. 11. Rebirth (Jati) - The physical process of birth into a life body. 12. Old age and Death (Jara-maranam)- Aging, Illness, Unsatisfactory feelings/events, and Death. With the death of the physical body of one life, this sets in motion the Karma for another being's lifetime. According to the teaching stories, the Buddha discovered these links by beginning with the endpoint of Samsara and Dukkha. Through meditation and investigation he traced the process back to fundamental ignorance of the truth (Dharma). As stated in the Noble Truths, our experience of Dukkha is dependent on all the other aspects of our experience and clinging.